When we setup a new domain, the registrar frequently advises us to wait patiently, before continuing. Congrats on your new domain! Now, we suggest that you wait 24 - 48 hours for the new domain to propagate, before trying to publish to the domain. Responsible helpers will occasionally provide advice to be patient, in Blogger Help Forum: Get Help with an Issue. After you correct the addresses, please wait 8 hours (2 x "14400" seconds) before continuing. This will let all DNS servers on the Internet receive the corrected addresses. This advice is generally given, for domains that use a 4 hour ("14400" second) or greater Time To Live or TTL. Many registrars use a 1 ("3600") or 2 ("7200") hour TTL, for individual domain DNS addresses. Domains with 2 hour or less TTL generally do not require latency advice, because most forum topics take more than 2 - 4 hours to complete. Adding a domain - and updating a domain - involve different latency. The difference between "new domain" and "domain update" advice - and irregular presence of either - causes confusion. Some advice about domain updates involves unnecessary waiting. In other cases, new domain owners jump right in, and try using their new domains, immediately - and regret later. Moving too quickly, with Blogger custom domain publishing, can lead to Google database corruption. Fear of the apocryphal "Another blog ..." error - and similar Blogger access disruptions - leads many technical helpers to routinely advise unnecessary waiting periods. People who make changes, and see their changes work immediately, cause similar confusion. Somebody who is advised to wait 2 to 4 hours, before publishing the blog to the domain - and who observe that the domain, perversely, is immediately operational - may misunderstand. Remember that everybody who wants to read a blog won't have the same DNS service. Differences between one reader (or search engine), and another, will cause various confusions. Waiting too long wastes time - but not waiting long enough can cause worse problems. For best results, there will be unnecessary waiting, sometimes. Just be aware of the different latency periods - and try to provide relevant advice. Domain addition latency can be 24 to 48 hours ("86400" to "172800" seconds). Domain update latency can be 10 minutes, to 48 hours ("600" to "172800" seconds). Domain addition latency results from the different name servers - and server owners and update policies - all over the Internet. Any given name server updates their local domain master database periodically, by retrieving the zone file from the various master name servers. If the domain master database on a given server is updated daily - and if your domain was setup 1 minute after the daily update, your domain will not be added to that server until the next daily update. Now consider that there are thousands of name servers, owned by hundreds of registrars, ISPs, and other Internet services. All local name servers are updated on a schedule considered appropriate, by the owner of each service. For best results, your domain needs to be indexed on any name server that might be used by any one of your readers - or any one of the search engines that provide necessary search results, for any one of your would be readers. Do you see the possibilities for confusion, for any new domain? This justifies waiting "24 to 48 hours", so your new domain will be visible to everybody, at the same time. This strategy hopefully will prevent possible Google database corruption. Update of individual DNS addresses will generally be more prompt - and can be researched, using a Dig log or similar display. The TTL latency for any given DNS address - unlike the domain master updates - can be easily adjusted, and determined. As an example, here is the DNS address which controls visibility of this blog, as shown in a Dig log. See the "3600" for "blogging.nitecruzr.net"? See the "3600" for "blogging.nitecruzr.net"? 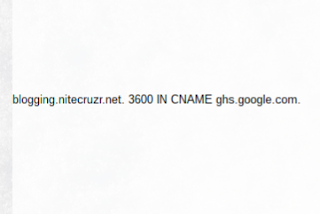 That tells us that "blogging.nitecruzr.net" updates on a 1 hour (3600 second) basis. After you correct the addresses, please wait 2 hours (2 x "3600" seconds) before continuing. This will let all DNS servers on the Internet receive the corrected addresses. Since most Blogger forum discussions about DNS addressing take place over hours or days, a 1 hour latency is generally inconsequential. Keeping it simple, I don't bother with a 1 to 2 hour latency, when providing address correction / update advice. A 4 hour or greater latency, on the other hand, I generally mention in my advice. When adding a DNS address, as part of address correction, latency will be close to 0 seconds. If you need to retrieve an address for a new host, just defined by the blog owner, you'll either get it immediately from cache on the local name server, or from the local server requesting an immediate update from the domain master server. Deletions and updates, which reference out of date / redundant addresses, are subject to address latency. Understand the different latency numbers. Additions are only relevant for NEW domains - and they lead to the "24 to 48 hour" advice, as the latency involves the Internet infrastructure in general. Address corrections are relevant for UPDATED domains, such as DNS address corrections - and latency is involved on an individual address basis. By being more selective when we advise waiting "24 to 48 hours", we can provide more consistent and vigourous testing advice - and encourage more effective domain additions and updates. And this will be better for custom domain publishing, in general. InterMedia: What is DNS propagation? WebHosting: What is DNS propagation and why does it take so long? And, try these DNS Propagation Checkers, for experimentation. Not every Blogger blog owner understands the cause, and the effects, of DNS latency - or the detail that there are multiple latency figures, which affect custom domain publishing in various ways. To better plan a custom domain update, it is good to understand the different causes of latency.